The foremost responsibility of an Eagle Scout is to live with honor. To an Eagle Scout, honor is the foundation of all character. He knows that "A Scout is trustworthy" is the very first point of the Scout Law for a good reason. An Eagle Scout lives honorably, not only because honor is important to him but also because of the vital significance of the example he sets for other Scouts. Living honorably reflects credit on his home, his church, his troop, and his community. May the white of the Eagle badge remind you to always live with honor. The second obligation of an Eagle Scout is Loyalty. A Scout is true to his family, Scout leaders, friends, school, and nation. His loyalty to his troop and brother Scouts makes him pitch in and carry his share of the load. All of these help to build the loyalty that means devotion to community, to country, to one's own ideals, and to God. Let the Blue of the Eagle badge always inspire your loyalty. The third obligation of an Eagle Scout is to be courageous. Courage has always been a quality by which men measure themselves and others. To a Scout, bravery means not only the courage to face physical danger, but also the determination to stand up for the right. Trusting in God. With faith in his fellow man. He looks forward to each day, seeking his share of the world's work to do. Let the red of the Eagle badge remind you always of courage. The fourth obligation of an Eagle Scout is to be cheerful. To remind the Eagle Scout to always wear a smile. The red, white, and blue ribbon is attached to the scroll of the Second Class Scout award, which has its ends turned up in a smile. The final responsibility of an Eagle Scout is service. The Eagle Scout extends a helping hand to those who still toil up Scouting's trail, just as others helped him in his climb to the Eagle. The performance of the daily Good Turn takes on a new meaning when enters a more adult life of continuing service to others. The Eagle stands a protector of the weak and helpless. He aids and comforts the unfortunate and oppressed. He holds the right of others while defending his own. He will always "Be Prepared" to put forth his best. You deserve much credit for having achieved Scouting's highest award. But wear your award with humility, ever mindful the Eagle Scout is looked up to as an example. 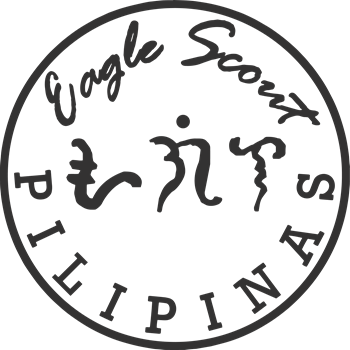 May the Scout Oath and the Scout Law be your guide for tomorrow and onward. I took the initiative to use the same meaning of the Eagle Scout Medal of America since we are of same principle and meaning. The excerpt can be found at Henning's Scouter's Pages and from US Scouting Service Project.